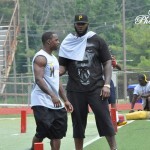 I saw it happen first-hand on Friday at Piscataway High School at the first Malcolm Jenkins Foundation Football Camp. I was totally blown away at what I saw. Jenkins is a former Piscataway football and track star who plays for the NFL’s New Orleans Saints. 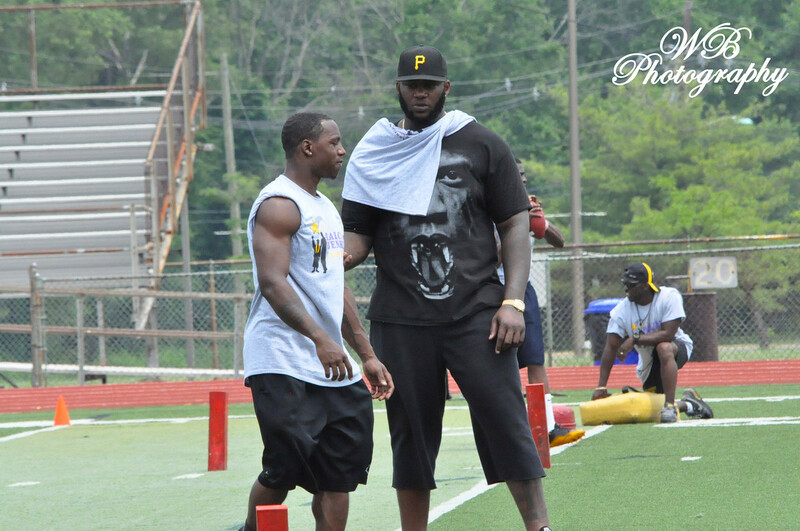 Jenkins and a host of NFL players, along with Piscataway coaches, players and former players, were out in the brutal, 93-degree heat teaching a group of 200 kids how to run, block and tackle. They gave six hours of their time on Friday and will give six more hours on Saturday with 150 more kids. All for free! The campers didn’t have to pay anything and the NFL players flew in from all over the country with all expenses coming out of their pocket. All because Malcolm Jenkins asked them. 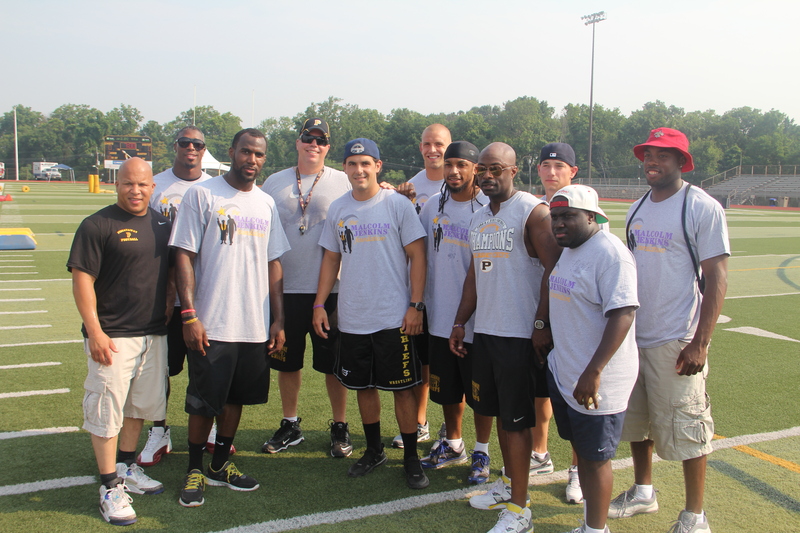 Among the NFL players on hand were Jenkins, Kyle Wilson (Jets) and Anthony Davis (49’ers), who all played together on the 2004 undefeated team at Piscataway and who were all first-round draft picks in the NFL. The three were re-united for the first time since their high school days. Also on hand from the NFL were Lauranitis, Isa Abdul-Qudus (Saints) and Roman Harper (Saints). The list is expected to grow on Saturday with the presence of Larry Fitzgerald (Cardinals). The former Piscataway players on hand included Marvin Booker, Rob Rose, Matt Voliva, Myles Savage, Vincent Wilson and Steven Miller. “I have a huge passion for giving back,” said Jenkins. The Malcolm Jenkins Foundation was formed in 2010 by Piscataway resident Gwendolyn Jenkins, Malcolm’s mother. Thus, the Malcolm Jenkins Foundation was born with Gwendolyn Jenkins serving as President and Malcolm Jenkins as Chairman. 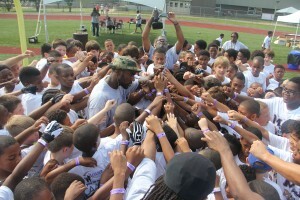 The community work of Jenkins was recognized by the Saints, who chose him as the 2011 New Orleans Saints Player of the Year. While I was simply in awe of Jenkins and all these men donating their time and putting forth so much energy all for the benefit of kids in severe heat, I also had so much fun reminiscing with Jenkins, Wilson and Davis, whom I interviewed numerous times in high school. Davis lit up when I told him how I remembered him on the varsity basketball team as a sophomore and how I recalled his little spin move in the lane with a soft jumper to go with it. Then when I asked him why he left the team as a junior after scoring 14 points in the season opener against J.P. Stevens, he said “To focus on football.” What a good move. And I was very excited when, searching for Jenkins, he found me and came up to say hello and welcome me to his camp. I was surprised he remembered me because after all, the last time I saw Malcolm, I was interviewing him at the New Jersey Meet of Champions track meet in 2005. It was certainly an awesome day for me, but for others too.